My first understanding of the corrupting influence of lobbying crossed my mind again during my most recent 6000-mile cross-country trip with my English Bulldog, Mugsy. During that day we had traversed the last leg of the northern plains stretching from Bismarck, North Dakota through almost the entire state of Montana. I remembered as we drove past the Great Falls of the Missouri River and caught the first glimpse of nearly 9,000-foot Red Eagle Peak that this eastern slope of the Continental Divide was originally intended as the border between Montana and my native state of Idaho. As I grew up I was told that the area on the map where it looks like Montana took a bite out of Idaho occurred because members of the survey party had been drinking, made a wrong turn and dropped down to the Bitterroot Range far too soon before getting back on track again by picking up the Continental Divide just below the nose in the face carved into Idaho by today's western boundary of Montana. I guess the nasty habit of blaming humble public servants for the actions of lobbyists and elected officials isn't new nor is it the result of the fact that the amount spent on lobbying Congress more than doubled in just the last 10 years to more than $3.3 billion last year alone. If not for this so-called mistake nearly all of Glacier National Park along with other scenic places on the western side of the divide such as the Bob Marshall Wilderness Area, Whitefish, Kalispell, Flathead Lake, Libby, Missoula, Lolo and the Bitterroot River Valley should've been included in Idaho where their terrain is far more complimentary than with the plains. In college I learned that the story about the survey party was legend but the truth about so much of Idaho was placed in Montana instead is much more complicated and, I dare say, fascinating. The before and after land distribution is illustrated by the two maps from the 1860s shown as images in this blog. All of what was originally intended to be Montana, along with what became the other plains states defined by the boundaries of the Louisiana Purchase in 1803 when the fledgling United States bought the land from France using deficit financing (OMG) from Great Britain and the Netherlands. That territory today makes up about 23% of the United States of America. The northwestern boundary of the Louisiana Purchase ran along the Continental Divide which to the west defined Oregon Country and in 1848 the Oregon Territory, then the Washington Territory and then sixty years after the Louisiana Purchase the Idaho Territory created by Congress as the Civil War was winding down. President Lincoln appointed a Republican, transplanted Ohioan and Union Army veteran named Sidney Edgerton as Chief Justice for the US Territorial Court there. William Wallace, another Republican Ohioan had already been appointed Governor of the Idaho Territory by Lincoln following his completed a term as governor of the Washington Territory. Apparently Wallace, who had already lived for many years in the Pacific Northwest, shared that region’s resentment of the appointment of outsiders. In turn, Judge Edgerton was apparently insulted when Governor Wallace assigned him to the then-remote district west of the Bitterroot Range rather than assigning him, as presumed, for the post of chief justice to the district around the then-Territorial Capital of Lewiston west of the Bitterroot mountains. On a return leg of that same cross-country road trip last year I drove with Mugsy off the Palouse down through the 64 switchbacks of 2000’ Lewiston Hill and into its namesake which had been founded back then in the wake of a gold rush and had just begun its two year stint as the Territorial Capital. We then headed up the Middle Fork of the Clearwater across the Bitterroot spine of the Idaho Panhandle, up and over Lolo Pass tracing the route used for millennia by the Nez Perce Indians and nearly six decades before Wallace’s snub of Judge Edgerton by the Lewis and Clark Expedition before we dropped down into the Bitterroot River Valley where he was assigned to preside. 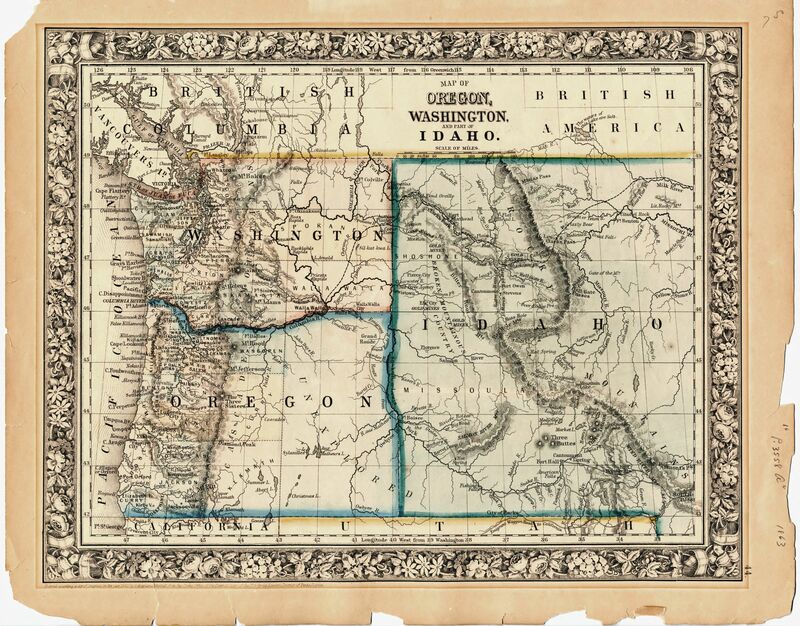 Much has been made of the snub and a quick and revengeful trip East by the Judge with pockets full of gold to persuade Congress to alter Idaho’s border by lopping off his judicial district and grafting it instead to a part of the Dakota Territory being used to create the new Montana Territory. But the issue was further complicated because the divide between those on the west and east of the Bitterroots also reflected the divide between the north and south. Lincoln and the Republican-dominated Congress knew the people populating the three territories of the Pacific Northwest were predominantly Democrats, many from the south and southwest. So a perfect storm of personal politics, money, lobbying, accessibility and partisanship changed the eastern boundary of Idaho mapped at this link to the one at this link. Later a similar combination moved the part of eastern Idaho which then embraced both sides of the Teton Range and included the Jackson Hole Valley as well as the resource-rich area from the Star Valley to Rock Springs over into the plains state of Wyoming.